As promised some time ago, the cleanup of retro-bolting at Kaputar is now almost complete. See updates on thecrag.com and statement below. We await the inevitable kerfuffle. A happy and tradful 2018 to all. (Endorsed by: Peter Blunt, Ian Brown, Scott Camps, Richard Curtis, Taib Ezekiel, Angus Farquhar, Adrian Kladnig, Vanessa Wills [some of whom would have preferred a stronger position]). Since the first climbs were done in Mount Kaputar National Park in the 1960s, it has been a predominantly trad climbing area. Until about ten years ago, most of the hundreds of established climbs were protected entirely with natural gear. A small number of climbs had one or two bolts, and a few independent, fully bolt-protected climbs had been done. The 80m north face of The Governor has been regarded as one of the premier trad crags in Australia, with more than 80 multi-pitch climbs, many of very high quality, mostly established in ground-up style and with only a few bolts in total (and often at the technical limit of the climbers). Since about 2005, more bolt-protected climbs have been established, particularly on Euglah and then Lindesay, then The Governor. At first these were independent of established trad climbs and on otherwise unprotectable rock. But over the past few years other climbers have been retro-bolting over the top of existing climbs. This practice began on Mt Lindesay and then extended onto the Governor. On Lindesay, about 200 bolts have been placed, most of which retro-bolt or impact on at least 20 existing climbs. Bolts are very close together and some bolted lines are only one metre apart. Many bolts are placed beside good placements for removable gear. Numerous chains have also been installed at the cliff-top, and the climb grades painted in large letters along the bottom. Some of the bolts have been found to be dangerous – either glue-ins on which the glue never cured (and which pull out by hand), or dangerously short ‘studs’ (see images). These are not assessable without removing them. Some of the retro-bolted Lindesay climbs are on the bold side, while others are very well protected with natural gear. On The Governor, at least 60 bolts were placed which either retro-bolt existing climbs, or squeeze up very close to them. Natural lines on The Governor’s columnar structure tend be only a couple of metres apart, so any new bolted climbs will impact on adjacent trad routes. Eight climbs have been impacted, including the popular moderate classic Clandestiny, and its start that gives access to five other climbs. Additional chain anchors have been installed at the cliff-top. Some of the new Governor bolts have also been found to be dangerous, including a chain anchor with un-cured glue. The retro-bolting on both Mt Lindesay and The Governor is visually intrusive, using large stainless ring bolts or shiny stainless brackets. The people who have done this retro-bolting are not known to have consulted with first ascentionists, other Kaputar climbers or NPWS. Some first ascensionists and other climbers are angry. A number of climbers who love the special qualities of Kaputar climbing became very concerned about this trend and joined together to take action. The objectives are to restore The Governor to a premier trad-only crag (ie. no sport routes), and to remove impacts on pre-existing routes on Mt Lindesay (retro-bolting etc). Most of the offending new bolts have now been removed and patched on both cliffs and the remainder will be removed shortly. Painted grades have been cleaned off. This has taken lot of work, time and expense by a bunch of people. If any of the bolts removed from these climbs are replaced, they will also be removed. Any new retro-bolting will also be removed. Why have we taken this action? •	Existing trad climbs and quality trad crags should be retained in their original condition. That means no retro-bolting and no bolting that impacts on the integrity, or ‘hanging space’, of natural lines. Good trad cliffs, and trad climbs in general, are limited resources which need protection. •	Retro-bolting on established climbs should be opposed and rectified. The NPWS will provide information and guidance on Service policy to visitors wishing to undertake adventure activities in the park, and will require minimal impact use of the park for these activities. 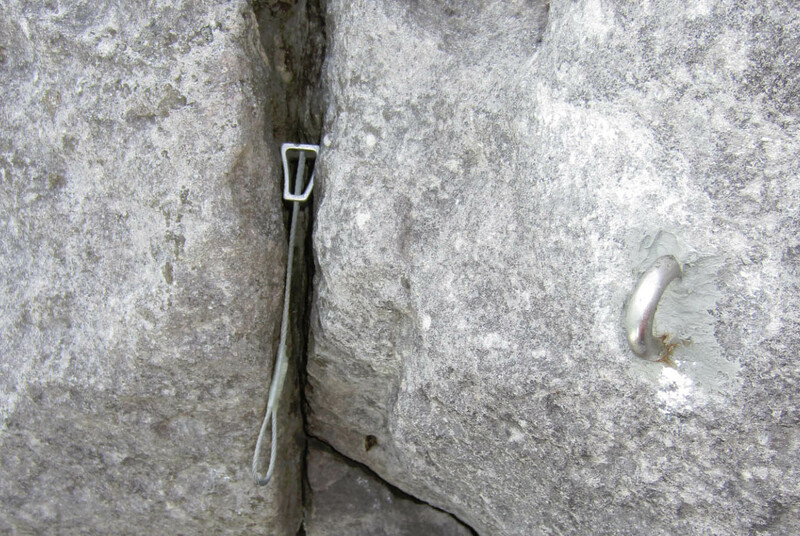 •	Excessive and unsightly bolting or other climbing impacts in national parks risk attracting the disapproval of other park visitors and park authorities, and may threaten ongoing climber access to these areas. Trad climbing at Kaputar requires judgment and skill. Important skills include route-finding, down-climbing (when necessary) and finding and using natural gear placements - which are often small wires or cams/nuts in unexpected places. Kaputar is a good place to learn and apply these skills because it offers trad climbs at a wide range of grades. Protection is often very good but not always obvious from below. Poor protection is usually mentioned in route descriptions, and/or allowed for in the grading (i.e. increased grade for poor protection). Bold routes on Mt Lindesay can be easily top-roped. Route descriptions on thecrag.com will be amended where necessary to assist safe climbing on climbs that were previously retro-bolted. But climbers should always be wary of attempting trad climbs that are close to the limit of their ability. Good work an well done to tha rectifiers. RIP tha turkey attitude that desecrated tha place an may it remain always buried. Good one Kaputar liberation crew. Oh, and I reckon bro ChossDog would make an excellent politician or Yes-Minister candidate, due having a contentious media release on the eve of a public distraction day! That's cuban commie speak for 'Let's go chop bolts in Victoria next September"
Well done ChossDog and Co! Good on you, well done. Oh yay! A bolting thread! Nice work at Kaputar Choss Dog (and friends); let’s hope the fix remains permanent. You have inspired me to make 2018 the year that I fix up some of the routes at Point Perp that have suffered a similar fate. Here’s an example of what annoys me about the ‘new’ routes. Fixed wires next to perfectly good rings? The right hand 'Un-cured Glue" bolt could well be correctly set glue- they unscrew very easily while despite being very strong. For instance by hand with a 6" 150 mm shifter. But chops these because they shouldn't be there, not because they are bad bolts. Nah, has not unscrewed, look at glue in thread - not possible.. Thank you ChossDog and Kaputar-liberation crew for the work that you have done to retain the adventurous spirit of Kaputar and the honour of the first ascent style of the climbs involved. I look forward to enjoying your retro-retro work! >with a 6" 150 mm shifter. >But chops these because they shouldn't be there, not because they are bad bolts. Why havnt peeps suggestD replacing with pitonz insted like in Tasweega? My frend Surely says that theyd B plenty strong enuff , an thered hav2B at least 1 otha thatd agree? Liza , my otha fiend , seriously what do U wreckon , being Tasweega-centric an all? Late to the party- just read the full story in Vertical Life - just wanted to add thanks for your efforts. Must have been a big job. Short of the back and forth here of the battle, what means are there for a real public awareness campaign? Perhaps the guidebooks would be the best place to spell this out for a generation that have never had rock mentors other than the gym top-rope? I don't think they care mate. "I can't climb that, it's not safe, so I should bolt it"
>other than the gym top-rope? Unfortunately the main retro bolter and crew in the Kaputar incident were not fresh from the gym, but spouted many of the arguments that Ian outlined in his article. Short of speaking directly to the main retro bolter, making this issue public on the Queensland access site on FB, where it created a lot of discussion, and posting here, and doing the magazine article, and having an ethics blurb on thecrag that people probably ignore, I am not sure how to disseminate the alternative view that not everything needs to be bolted except to mentor people into the joys of trad climbing, and when all else fails remove the bolts, which is hard and sad work. At Kaputar there is plenty of rock. Why those bolters seemed to target existing routes is quite bizarre but I can only assume they did so deliberately to make things more "accessible".If they had used their energy ( and improved their bolting skills) to put up independent new routes people might have grumbled about style, but I can think of 2 areas on Lindsay rock tops with easy access, no existing routes, no easily protectable trad lines that would support 25 new sports routes to grade 20 on rock as good and as well featured as that around thanks for the Mammaries etc. I would rather not see that happen, but if that had occurred we would be respecting differences.